Presenting the ”Big Three” Edmund Scientific Telescopes! With only minor tweaks remaining, they are ready enough to present here after a long restoration process detailed >HERE<. I want to thank everyone here on Cloudy Nights for all your helpful input. Special thanks need to go out to all those who enabled this project with parts and advice. Big thanks to Neal, (apfever), who responded to my want ad and basically filled my missing parts list! Not to mention all his expert advice having done this before. 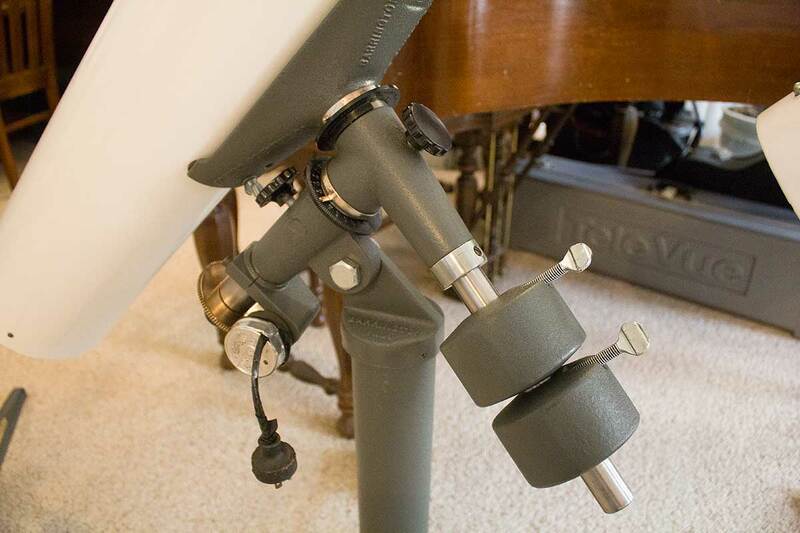 Then there is Gary, (Garyth64), who gave me a whole mount with drive and extra pedestal! Wow, huge thanks! Thank you Clay Kessler for your fine machining help and for the extra Palomar EQ head!! Those parts came in handy! Still more thanks to Chuck Hards for offering up a set of aluminum setting circles!. Thanks drmedjools also for yet another mount that I will work on when it arrives. Last but not least thanks to everyone here on CN who offered insights with your posts especially clamchip, Tom Kiehl, terraclarke, Bomber Bob, Marc-Andre, and many others!! First is the before shots of the 8", 6" and 4 1/4" that were sitting in my garage for years. Then the completed restorations! Edited by licata, 22 March 2019 - 04:49 PM. Excellent results, they look great! 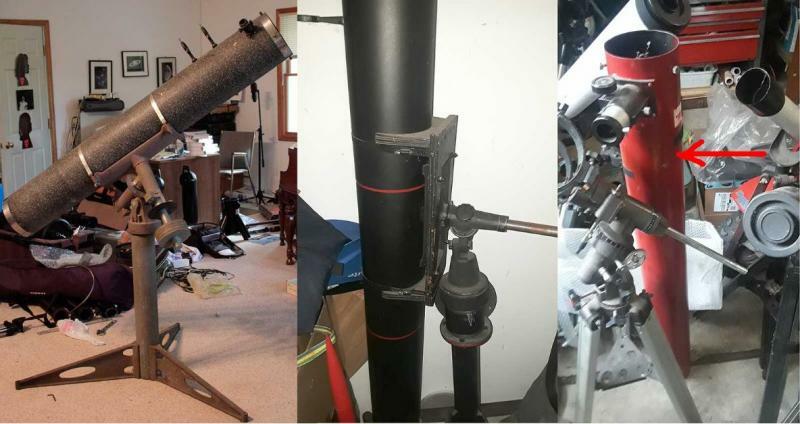 Getting three old scopes done that have been sitting for years takes real perseverance. You should be proud. It's also great to hear how members of the Classics community pitched in. BTW, That's one way to fill a living room. Real nice work on the restorations Tony. Its great seeing old scopes like this again in good working order. Tony , Most Excellent Museum Class Restoration . I must add for doing three restorations in the small amount of time you took ........OUTSTANDING ! May I ask what Detroit area Museum will be so lucky to display these Fine Pieces ? Wow! That really puts it into perspective for me. The 8” is really BIG!!! 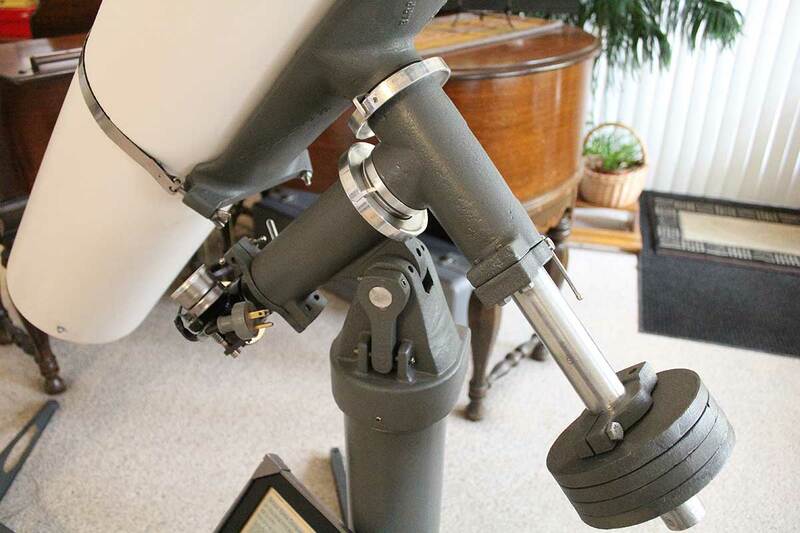 Here's a close up of the HD mount. ...May I ask what Detroit area Museum will be so lucky to display these Fine Pieces ? Some instructors from the local college and I are still working on the city of Farmington Hills, (a Detroit Suburb), to build a public observatory in a local park. We have been drawing hundreds of people per month for our events and public observing. So we think we have a good case with them. It will be here in the observatory where we will partition a "museum" space for these scopes. If this falls through, there are several other possibilities, but I haven't approached them. This is where my focus will shift now that the resto is done. Edited by licata, 22 March 2019 - 06:49 PM. What the Edmund showroom in Barrington New Jersey must have looked like! They look new from the day they were built. I had the 8" , but mine never had that clamp above the counter weights. Edited by CHASLX200, 22 March 2019 - 06:57 PM. The clamp does not belong above the counter weights. 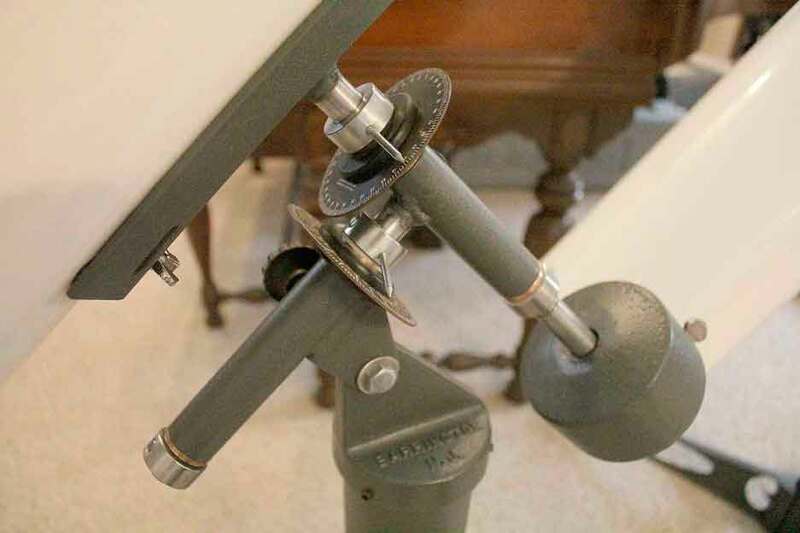 I am missing a retainer ring (I think), so I put it there to keep the weights from slipping up the shaft when the mount crosses the meridian. I added a clock drive which uses a different clamp on the RA shaft. That is why I have an extra clamp. Second that! I have the 4 and the 6, and never would have envisioned the 8 to be so much bigger! You need a classic ladder to go with it! Beautiful work! Heh heh, yeah, the eyepiece is way the heck up there. And I cheated the balance on the low side. Gonna put a hunk of lead up there and rotate the tube for actual use. Hi Tony - I have fond memories of my Edmund GEM that I used with a home brew 6 inch F8 scope I built back in the late 1970s. I'm currently recreating that scope with some of the old parts but alas, I lost my Edmund GEM years ago during a move and never have found another one. Keeping my eyes peeled since I would love to find one to fit to the new 6 inch F8 that is being built... Have my mirrors and a few odds and ends that survived the past 20+ years to be put into the new version. Those scopes you restored are just beautiful and will make more wonderful memories and nights looking at amazing objects possible. Great work and thanks for sharing! Amazing job! I don’t think that new Edmund scopes ever looked as good as yours. 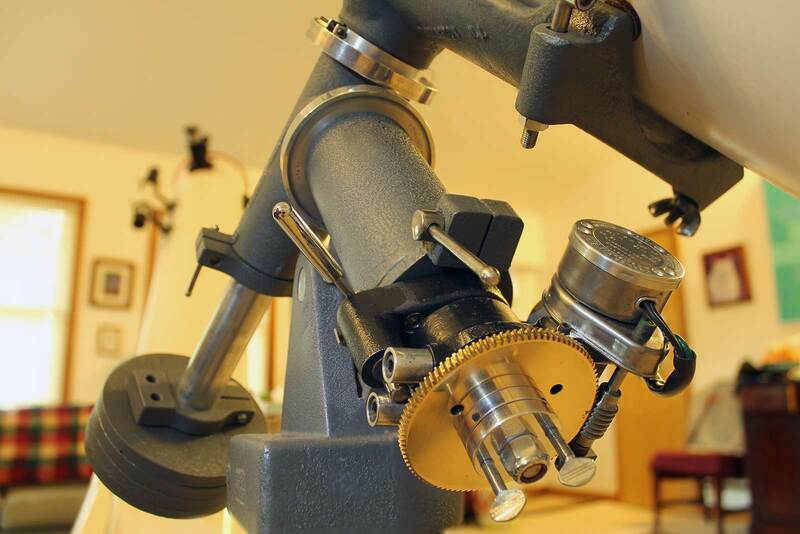 You scopes have certainly had more individual attention paid to them than any that would have left the factory. Congratulations on a trio of fantastic restorations! 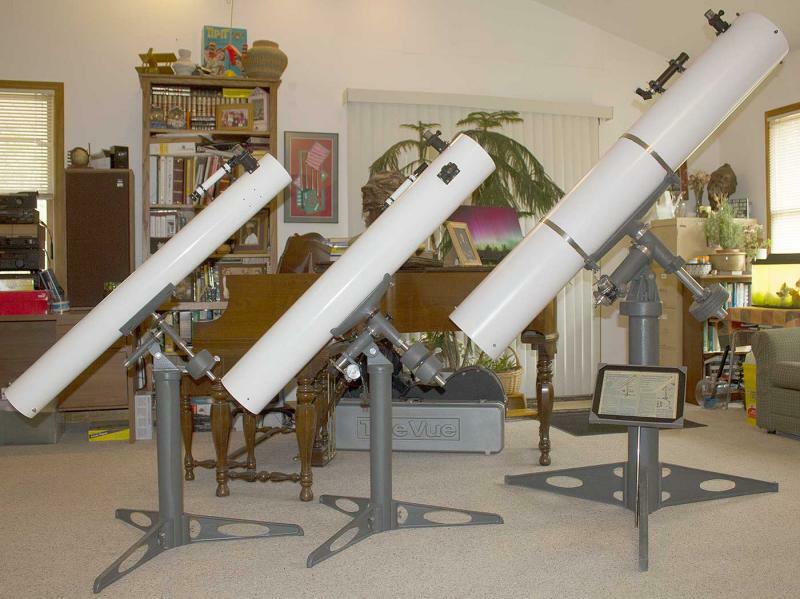 The 4.25" and 6" were the next respectively of my first three scopes ever (I got the 3" in December of 1965)! What is in the big Tele Vue box under the table? Oh, that old thing? It's just something I set up when I have nothing else to show. It's an NP101. I'm waiting for it to become an antique lol. Great idea and outstanding execution. To see the three of them, all in pristine condition gives me great pleasure. Together they are more than the sum of the parts. What is the brochure on the 8"? Is the old Edmund ad from S&T? How do the optics perform? A contemporary master optician told me the Edmund mirrors were really good. The 8" mount looks beefy. Is it cast iron? How much does it weigh? Edited by KentTolley, 23 March 2019 - 04:14 PM. My very old 8" F/8 Edmund was very sharp. Mount is around a 100 lbs with base. I think it was cast iron. The brochure is a 1973 Edmund Catalog open to the 4" and 6" pages. The 8' is on the next page. Mine are actually earlier. The 8" is pre 1965. the 6" is about the same. Not sure on the 4" Palomar. Optically I have only star tested the 6" and it appears to be very good. The 8" just came back from coatings. Prior to this it was a mess, and it is assembled here for a picture. Will be collimating and testing it soon. The old owner of the 8" just told me it was all Edmund but to me the mirror looks like a Walter Grabow to me. Either way I am sure it is excellent.